ron tree, fossil tree, father of all trees, god-blessed, protected by spirit’, words do not lack to describe the argan-tree. This tree intrigues, astonishes and one might believe, like the Berbers that the tree they call argan is truly a magic tree. With its tortured profile, knotty harmonious form the argan tree is very strange : its snake-skin trunk twists, its branches intermingle. Free and wild it grows where it wishes in all shapes. It is sensitive, strong and tenacious; it provokes respect by releasing exceptional energy. And it really needs energy to grow in this region of Souss, southern Morocco. Between Issaouira, Taraudant and Tiznit the only argan forests in the world stretch over 800.000 acres. 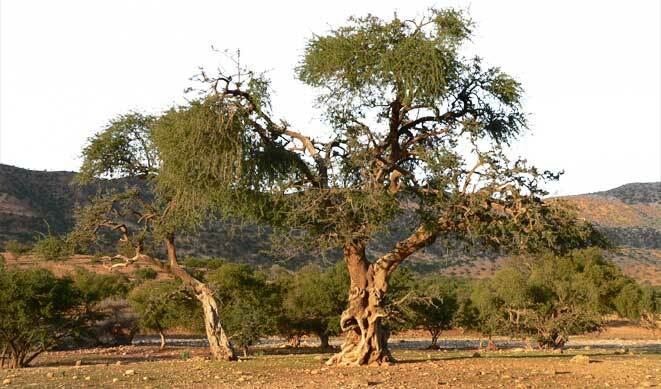 The argan tree finds in itself the remarkable vitality needed to survive in this part of the world where the semi-arid soils, the low rain-fall and extreme temperatures do not discourage it.